Avingard had slept better than he had in weeks. The bed in the Bannered Mare was more comfortable than the one in Dead Man’s Drink in Falkreath. He slept so well, in fact, that he didn’t hear the revelry that was going on below in the main room of the in, despite the fact that his room looked down into the main room. After rising to his feet, and doing a quick stretch to remove any stiffness that had set in overnight, Avingard gathered his armor and greatsword and exited the room. He walked down the stairs, past the fire that was still burning furiously, and walked over to the bar. Hulda explained the different foods and drinks for Avingard, which all seemed good to him. He would buy some food and some mead, and then ate his purchases as he sat looking around the room. 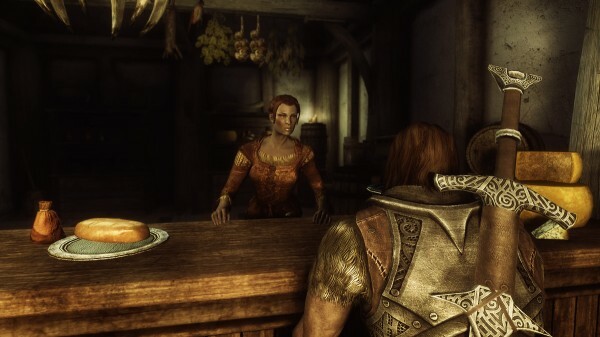 Avingard talking to Hulda in the Bannered Mare. Hulda didn’t seem to want to get into a deep discussion about the Civil War. “Have you had much experience in combat,” she asked. To all able bodied men and women of Whiterun. The bandits located in Silent Moons Camp have been harassing, robbing and attacking citizens and visitors. The task seemed like something he could handle, so he thanked Hulda and left the Bannered Mare. Outside, in the market, the owner’s of the stalls were setting up for the day. Avingard didn’t waste anytime looking at the stalls as he rushed passed and headed towards the entrance to Whiterun. He quickly left Whiterun and headed down the road out of the city. Turning north Avingard looked across the tundra, which consisted of small bushes and ponds, he stopped to smell the fresh morning air. Avingard then proceeded to Silent Moons Camp. On the way, Avingard came across a shallow small pond. The one thing that set this pond out from all the others was that a skeletal hand was poking out from the water. In the hand someone had placed a steel sword. 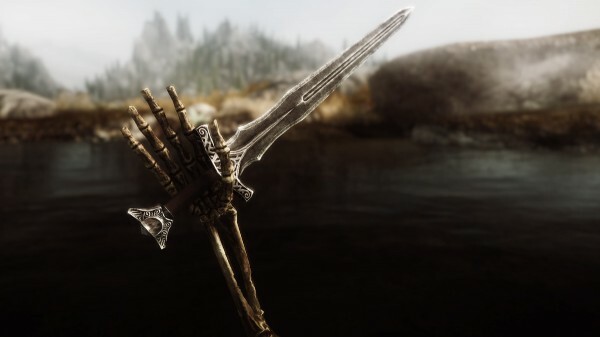 Skeletal hand holding a steel sword. Avingard looked around to see if anyone was nearby, and to find a clue as to what this represented. He couldn’t see anything so he slowly walked away. He looked back at the hand every few steps, still confused by the hand, but then set his mind back on the work of getting to Silent Moons Camp and killing the bandit leader.